If I say "pocket hole jig", what's the first word that comes to your mind? I'll bet it's Kreg, and for good reason. Kreg has built an impressive line of jigs, screws, plugs, clamps and related hardware which has rewarded them with a name that has become synonymous with pocket hole joinery. 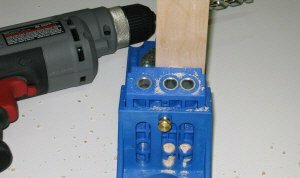 Kreg hasn't built just a jig, but a complete system that removes all the measuring and guesswork involved in doing pocket hole joinery the old fashioned way. 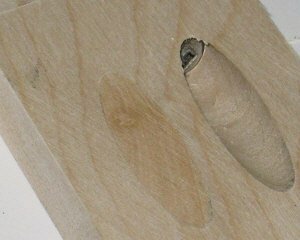 If you can make a few simple adjustments, you can do pocket hole joinery with the Kreg jig. Pocket holes can be used anywhere you want to fasten two pieces of material together, from simple repair jobs to building furniture and much more. 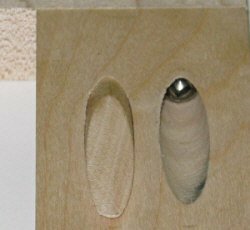 Although manufacturers have been using pocket holes for many years, it was only when Kreg introduced their easy to use jigs that it has become popular among woodworkers and do-it-yourselfers. 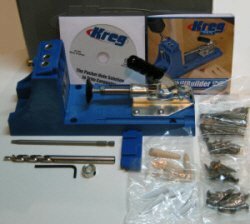 The model K4 pocket hole jig from Kreg comes with everything shown here. Two excellent DVD's are included that will give you all kinds of ideas on where to use this jig. Kreg offers four pocket hole jig kits that range in price from twenty to one hundred and forty dollars. They go from a simple one hole jig perfect for repairing furniture to the top of the line K3 master system that contains all you need to start you first project. I settled on the K4 kit because it was in the range I was willing to pay and it looked like it had everything I needed to get started. It doesn't come with the clamp or the material support stop available with the master system, but I have lots of clamps and can live without the support stop. The K4 comes with the main body which includes the removable drill guide block and toggle clamp, special stepped drill bit with an adjustable collar for setting the drill depth and an extra long screw driving bit. Also included is a spacer block, starter screw and plug set and two informative dvd's that show the many ways of how and where this jig can be used. Every time I get a new tool, I feel like a little kid again. About five seconds after the jig arrived in the mail, I was in the shop playing with it. It was pretty bad, I think I might have been drooling like Homer Simpson. Here I am setting the end of the step on the bit to 5/8", the thickness of the material I'll be drilling. Setting up the pocket screw jig involves two easy but important adjustments. First, you'll have to adjust the collar on the drill bit for the thickness of the workpiece. This sets the depth of the pocket hole. On either side of the jig are grooves made for the drill bit to sit while you make this adjustment. With the collar loose on the bit and against it's stop, slide the bit along until the end of the step on the drill bit reaches the mark that corresponds with the thickness of your workpiece. When you're there, tighten the set screw on the collar. In the photo above, I set the bit for some 5/8" melamine I want to try first. The second adjustment is pretty easy too. 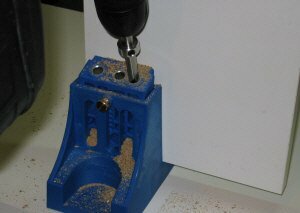 The drill guide block moves up and down in a slot on the jig and is locked in place with a thumb screw. To adjust, back out the thumb screw till the drill guide block is free and set to the thickness of the workpiece to be drilled. In the picture on the right, I've set it to 5/8". Retighten the set screw and you're ready to start drilling. This adjustment is necessary to allow the screw to exit in the middle of the workpiece. The thicker the material, the higher up the drill guide block will sit in the jig. My scrap pile generated some nice specimens for me to experiment with before I move on to more serious business. My first attempt will be some old 5/8" melamine shelving. I'm going to drill four holes, two on the left side and two on the right. The material is set on the pocket jig and clamped into position with the adjustable toggle clamp. 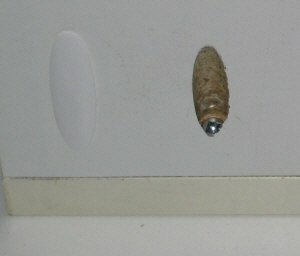 I set my two speed cordless drill on high and with the bit turning, slowly lowered it down the drill guide hole till I could feel it start to cut. I figured a gentle entry would create a cleaner pocket. I had to pull the drill up a couple of times to clear the debris before I bottomed out the stop collar against the drill guide. 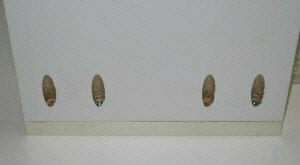 The photo on the right shows the results of my first attempt, with a couple of screws already cinched up. Not bad, but there was a little bit of tear out around the edges of the plastic laminate. I think this can be avoided by using a faster drill, so on the next try I'll use my 3/8" corded drill on some scrap hardwood. When driving the screws, make sure you don't overtighten and strip the hole. If you use a cordless drill, set the clutch low to start and adjust as necessary to get the right setting for each material. Take extra care with materials like melamine and particle board, they tend to strip out easy if you're too aggresive with the drill. A lot of the jobs I do involve hardwood of one sort or the other, so it will be interesting to see how the kreg jig performs with this material. I readjusted the jig and the drill bit for 3/4" thick stock and drilled the holes with my 3/8" corded drill this time. The holes came out nice and clean with well defined edges. I think the faster rpm's of the corded drill helped the bit cut rather than tear as it did on the plastic coating on the melamine. One thing I forgot to mention above is to make sure you clamp the joint together before driving the screws in. The melamine was slippery and hard to hold by hand. In the photo on the right I'm using a regular c-clamp to hold the two pieces of hardwood in alignment against a flat surface. If your clamp doesn't have a nice flat jaw, use a block of wood between it and the workpiece. 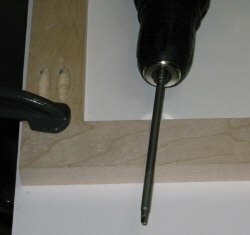 You should not be able to move either piece when properly clamped. This type of joint used in face frame construction needs to be aligned perfectly, so it pays to take your time. The extra long bit shown in the photo is supplied with the K4 kit. It's necessary because of the shallow angle the pocket holes present. This joint went together incredibly fast from start to finish. And this was only my second set of holes. I'm impressed. If all the pieces are precut and ready for drilling, I can see a complete face frame taking only minutes to assemble. Do you need to use glue? While glue can be helpful when gluing long grain to long grain, it doesn't add much strength to the joint when gluing end grain to long grain. Face frames, drawer boxes and bookcase shelving are typical of end to long grain joints. On the other hand, with some of the new super glues available today, the extra added security of gluing for some projects that see a lot of use can't hurt. I think it all comes down to personal preference and what kind of stress the joint will see. For face frames and other non-stressed applications, I wouldn't bother with glue as the screws will have more than enough holding power. One often overlooked aspect of not using glue is that if the piece ever gets damaged, you can simply unscew the damaged area, make a replacement, and reassemble. If you have kids, you can probably relate to this quite easily. Kreg offers screws to cover every application. Generally though, use fine thread for hardwoods and coarse thread for softwoods, plywoods, MDF and particle board. Kreg also offers a screw with a special coating for outdoor use that is rust resistant and available in four lengths. There's also a couple of different head styles, a washer style head and a pan head. The smaller diameter of the panhead allows the head to sit below the surface when joining 1/2" to 1/2" material. 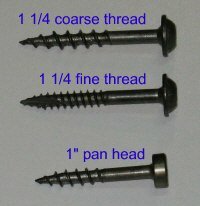 These screws are available in a variety of different lengths. All Kreg screws are self tapping. There are cheaper screws on the market, but the quality of the kreg screws is hard to beat. Keep in mind that the price per screw goes down when the quantity you buy goes up. If you have future projects that will require pocket screws, you'll save some money by buying in bulk. Sometimes you have no choice but to place a pocket hole where it will stick out like a sore thumb. Kreg's got you covered here too. 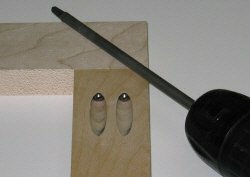 They manufacture solid wood plugs in a variety of hard and soft woods as well as plastic caps in different colors for laminated materials. The photo on the right shows a white plastic cap placed in one of the holes on the melamine I drilled earlier. I think it blends in pretty good. Nothing to it either, just push it in the hole and you're done. Melamine like this is available at most every building center in different thicknesses, widths and lengths for all kinds of projects around the home and workshop. It's cheap and it's easy to work with, especially if you have a pocket hole jig. Kreg manufactures solid wood plugs in a variety of hardwoods and softwoods that add the finishing touch in those instances where you can't place the pocket hole in a discreet location. The photo on the left shows the face frame type joint I completed earlier with the plug sitting in the hole. 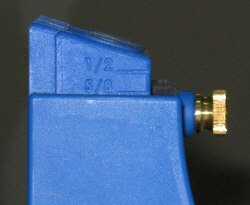 This was one of the plugs included with the Kreg jig kit. The plug is basically a dowel cut at the same angle as the hole, so I see no reason a guy couldn't make his own if he didn't want to buy them. Installation is quite easy, just glue and insert. I used regular yellow wood glue as I do for most everything else. After the glue dried, I used a small block plane to cut the plug down close to the surface and then finished it off with a belt sander. As you can see from the photo, it turned out not too shabby, although you can definitely see it's outline. I think if you made your own plugs from the same wood as your workpiece, it would be almost invisible. Maybe I'll look into getting a plug cutter and try it. Well, I can certainly see why the Kreg pocket hole jig has become so popular. I'ts fast, easy and makes a strong joint. I think it's well worth the money when you consider the time saved and the many possibilities where you can utilize this great tool. I'm getting lots of great ideas for future projects. Build sturdy drawer boxes using pocket hole joinery.